If summer is on the near horizon, as in two months away, and the general start to the summer vacation season, which we can pin on the end of May, is even closer, a theme park aficionado can count on one thing to definitely happen: The grand theme park roll-out of new, updated, or re-imagined rides and attractions. And Knott's Berry Farm is not dillying, nor dallying, on getting that summer new-ride vibe started up, lickety-split. So turn your sights upon the Buena Park theme park's Fiesta Village and the bright new twirling attraction in the distance, the one with spokes or, if you prefer, arms that stretch out like rays of the sun. It's the brand-new Sol Spin, one of the 2017 additions revealed by the historical play place back in the fall of 2016. The "thrilling topsy-turvy adventure," which debuted on Friday, April 21, takes guests "over six stories high as they rotate in all directions in one of the ride's six spinning floorless gondolas." Woowee. If your tummy didn't just do a lil' pre-drop when you read the words "floorless gondolas," then you have spent a busy lifetime chasing theme park thrills, to which we raise our fried treat on a stick in admiration. 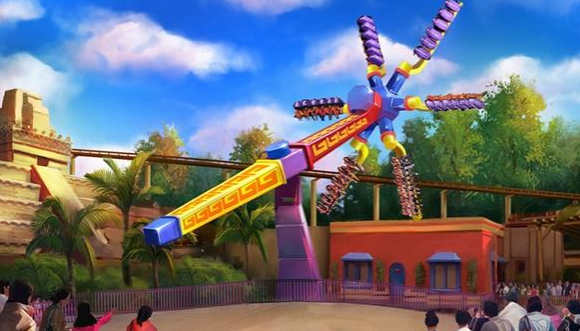 And if you know your theme park thrills, you'll know that Sol Spin is the first thrill ride at Knott's Berry Farm to be introduced in four years. What was the last one? You guessed it: Coast Rider in 2013. One thing to note, before you go Buena Park to check out the latest wheeee machine: Riders must be 54 inches tall to board Sol Spin. If you've got to be there for Sol Spin's opening weekend, loving thrills like you do, keep in mind that this is also the final weekend for the fruit-fabulous Boysenberry Festival in the Ghost Town area of the park. Over 70 different boysenberry-yummy treats are there for the buying and trying, so swing by, after you twirl it up, floorlessly, in a state-of-the-art gondola, for boysenberry buffalo wings or boysenberry fry bread.